Black and Decker Belt Sanders - Smarter tools with better results! 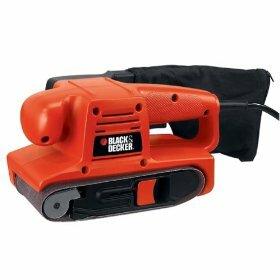 Black and Decker with its illustrious list of power tools, has budget friendly products with fair quality. The Black and Decker Belt Sanders are electronic machines that are used to remove wood and other materials used for finishing purposes. The main parts of these Sanders are the electrical motor and the belt of sandpaper which rotates with the motor. The Sandpaper is trimmed to fit over the belt, covers the belt by holding firmly. The beauty of Belt Sanders is the easy movement by which they run without applying pressure. 3"x21" Dragster Belt Sander: This is a wonderful tool to use while working in hard to reach areas especially at home and comes with 2 year warranty. Whether it's the kitchen cabinet, edges under railing, between spindles or on floors and counter tops they can aggressively help you. It helps to smoothen uneven edges. The design has a good low profile extension and benefits with 25% more contact with the sanding surface. The front wheel sands 3 times closer to the edges. The Retractable hood with three position adjustable handle adapts itself for different kinds of use and maximizes control. Powered with 6.0 and 7.0 amps versions, this has a dust collector to keep work area clean. The main disadvantage is the belt tracking where the operator spends most of the time centering it. Some of the woodworkers have problems with the power also as the belt stops with moderate pressure. Some carpenters question their durability too. ½ in Precision Belt Sander: Whenever there is a need to remove rust, paint and work on sanding ceramic tile for detailed cuts, trust the ½ Precision Belt sander. Their narrow design is the specialty and hence it can be used for less-width spaces. They are a wonderful ally for metal application and it is used to sharpen blades too. This removes precise material faster and excellent in detailed and curved surfaces. While using wood applications dust collection could be used. They have a 2 year warranty. This has a wonderful reputation among carpenters. 3"x18" Belt Sander: When narrow spaces have to be sanded this version is the best choice. This also fits into the tight places. This model is powered in two different versions of 5.2 and 6 amps. This model has a comfortable front handle and has a compact ergonomic design with 2 handles. The Auto belt tracking alignment eliminates belt adjustment. This model can be used for vertical surfaces too. This auto belt alignment does have its disadvantages since the belt starts losing track in just 5 minutes of usage. Even the 5.0 amp powered model has problems with the auto belt system. Though the Black and Decker Belt Sanders are appreciated for their lower prices, they need to improve their quality also. Return From the Black and Decker Belt Sanders Page to Home - Finishcarpentryhelp.com.